VO 6806 is a petrol-engined AEC Regal 662 with Craven B32F body new in 1931 to Bevan & Barker Ltd. (t/a Red Bus Service), Warsop Road Garage, Mansfield, one of three similar vehicles. 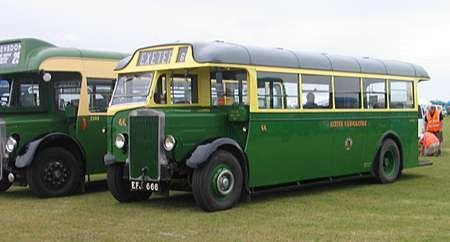 The company was taken over by Mansfield District Traction on 1st January 1957 along with eight vehicles – seven AEC’s and a Bedford. 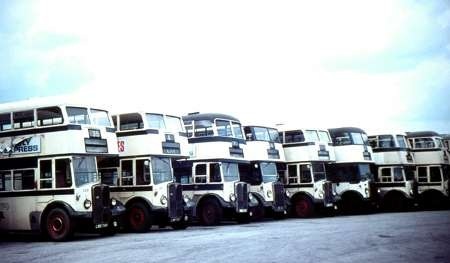 Of these an AEC Regal 0662/Massey and four Regent III double deckers (one with Massey and three with Crossley bodies) were retained by MDT for further service, but this, another Regal and the Bedford OWB utility were immediately withdrawn. VO 6806 was handed over to the British Transport Museum at Clapham for preservation, but this establishment was extremely London Transport orientated and the handful of provincial vehicles in their collection remained quietly in the background until in 1968 Halifax GM Geoffrey Hilditch persuaded them to loan him the Regal – along with an ex-Jersey PLSC Lion, an-ex-Swindon Arab utility and an-ex-Rotherham Crossley – ostensibly to take part in a parade through the town to celebrate the 70th anniversary of the undertaking. 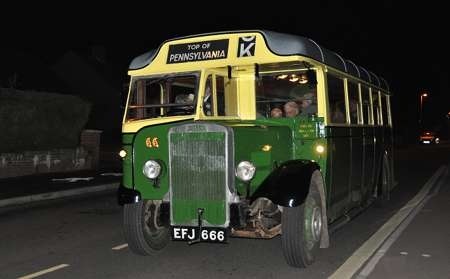 The vehicles were subsequently used in other local events and all four took part in the 1973 Trans-Pennine Rally, and the Regal is shown here manoeuvring in the tight confines of the original Harrogate location (before in later years moving to The Stray) at the end of that event. I believe that the four were officially transferred into Halifax Corporation ownership for the duration of the loan – indeed the Crossley was used for driver training on occasions – but when Hilditch moved to Leicester around 1975 they went with him to the best of my knowledge. Their present whereabouts are not known to me, although I gather they are all still in existence somewhere. It would be nice to see them out and about again though. Actually, on having a closer look this doesn’t look like Harrogate and may well have been Harry Ramsden’s Car Park at Guiseley en route. 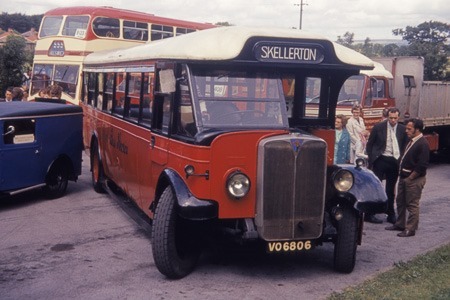 Both this Regal and the Leyland Lion are currently shown as being part of the Science Museum collection, though it is unclear whether or not they are on display or in running order. All four of these were (the last I read) at the Science Museum reserve collections centre at Wroughton, Wiltshire. Roger is right and I believe the AEC is stored at Wroughton. I was surprised how many vehicles are stored there including a Guy Arab which GGH also looked after. The state of some of them is not good but at least they are under cover. I guess we were lucky to see them running when we did thanks to GGH. I just wish we could see the exhibits more often as it is a national collection – no pun intended but there is a Leyland Nxxxxxxl there too! If they are at Wroughton and I think they are then they are being stored in an uncared for state. One of my colleagues was there recently and was asked not to take pictures because of the poor state of the vehicles. Colin Billington has tried several times to get vehicles moved to secure homes and inertia/unwillingness to take a decision has frustrated him. Wroughton, opened in 1940, was both an RAF and RNAS station for many years, with lots of original hangars, which hold the Science Museum’s varied "exhibits" in a far-from-ideal environment, hence their slow deterioration. Ribble white lady in the background. A pair of withdrawn Craven bodied Regent III are evident in this picture taken on the parking area behind East Bank Garage in May 1966. Further along the row is another one with the front number plate in the raised position (presumably to reduce accidental damage). 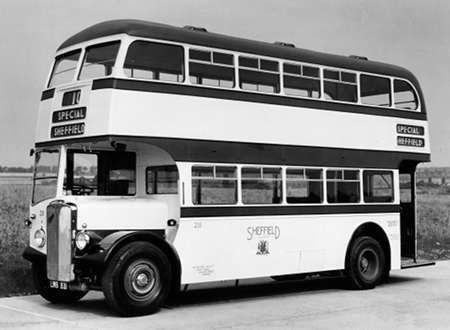 The next in line to the Cravens pair is 431, a 1950 Northern Coachbuilders bodied Regent III, note a similar bus just visible at the extreme right contrasting the grey and cream painted roofs. The same applies to the two all Leyland PD2/1 that can be seen. This area was the gathering ground for withdrawn buses pending being towed away by one of the Barnsley scrap dealers. Thanks for posting this gem Ian. As a boy, I would cycle from Birley to see the latest line-up on the roof of Eastbank garage (the journey back up could be a challenge). I’m surprised to see that the fleet numbers have not been blacked out in the traditional fashion. Any chance of a larger picture? There is larger shot at this link. Les, I suspect these had only recently been withdrawn. May 1966 would have been when large numbers of Atlantean PDR1/2 with Park Royal or Neepsend bodies were entering service. To the best of my knowledge fleet numbers etc were always painted out prior to collection for scrap. Cycling up East bank Road?? No thank you! The very handsome locally built Cravens Regents were well thought of in Sheffield with some giving 18 years service in the city. 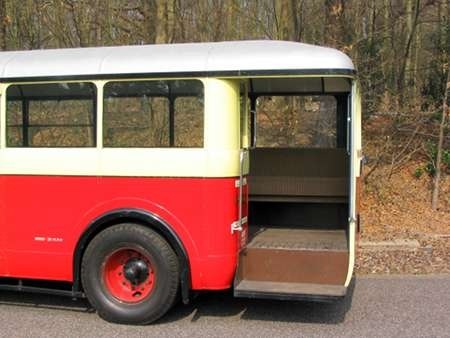 Here’s 231 of the 1949 delivery looking splendid when new in the manufacturer’s official photo. Today’s "stylists" and image-mongers and dreamers-up of nightmare liveries could learn a lot from this dignified vehicle. Oh, how I concur with your opinion, Ian. Fairly locally to me, Norfolk Green had a smart, traditionally applied livery in contrasting shades of green. Since the Stagecoach takeover the livery (and the service reliability) has plummeted to abysmal levels. The front three quarters is now a ‘swooped’ grey, followed by vestigial traces of green. The immediate impression on approach is of a military vehicle. One half expects the destination to display "Rations – No Lifts".